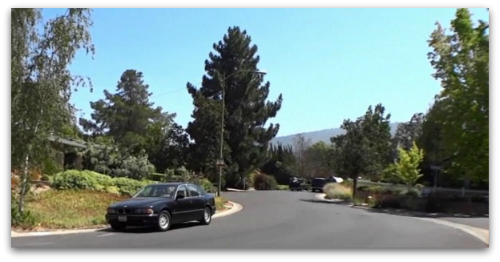 The Hillbrook neighborhood is a beautifully maintained part of east Los Gatos. It sits just off Blossom Hill Road, about one block from Blossom Hill Park, with several homes backing to that park. It consists of Hillbrook Drive and a little park at Hillbrook & Blossom Hill, Fairmead Lane, and Eastridge Drive. For area newcomers who might be confused – this is not the area right next to Hillbrook School, which is at the end of Marchmont Drive. Built between 1962 and 1965, the three dozen or so homes here are comfortably sized between 1600 and 3100 square feet and sit upon lots that are approximately a quarter acre. Nearly all of the houses are ranch style, but the few on Fairview represent a subset of the ranch style: mid century modern (most people think of Eichler, which is the predominant mid century modern type found in Silicon Valley, but these aren’t Eichlers per se). Although the houses are older, most have been updated and remodeled over the years, and are in great shape. The name Hillbrook appears to derive from the area’s proximity to nearby Blossom Hill (the foothill, not the road named for it) and for Ross Creek, which runs through the the neighborhood. 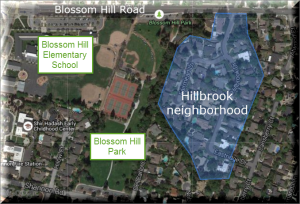 One of the major draws to this neighborhood is the close proximity of Blossom Hill Elementary School, which is part of the highly regarded Los Gatos Union School District. Homes in this little pocket do not turn over much, but the homes that do sell are running between about $1,500,000 and $2 million. The price naturally depends on many factors: home size, lot size, condition of the home, exact location, and so on. Although this small neighborhood is found just off Blossom Hill Road, it is not necessary to turn left on that busy street to get to downtown Los Gatos. Hillbrook Drive turns into Eastridge, and that leads to Lansberry, which can take you to Shannon Road. From Shannon there is a traffic signal for crossing Los Gatos Boulevard – often an easier way to go during rush hour. It’s easy to get to the park, to Blossom Hill Elementary, and to town from this location. Recently I was driven through the area and shot some video to share. Right now it’s August 2015 and we are in the middle of a very longstanding drought, so you will notice many “California gold” colored front yards. This is not typical at all – it’s just a response to the request for water conservation from the governor and our local water utilities. Shannon Road in east Los Gatos was named after Thomas Shannon, who came west to find his fortune in the great gold rush of 1849. This was just a couple of years after the tragic Donner Party journey, so his group of 30, who called themselves the “Jayhawkers“, took a southern route to California instead. Unhappily, crossing Death Valley was no picnic either, and many died en route to their land of golden dreams. Thomas Shannon was a survivor though, he made it to the gold rich hills near Sacramento and beyond and took a wife, Amanda Blackford, whose family had also come west in search of a better life. With the advent of the Civil War, he enlisted (7th California Infantry Company B) and served a year and a half in Arizona. After that, he and Amanda settled in the area we now call east Los Gatos, where they bought 160 acres of land. In 1885 he petitioned for a road to be put in, and it was later used to access the Guadalupe Quicksilver (mercury) Mines. The Shannon family home stood until the 1970s. I’m not sure where it was but it is gone now. The Shannons had 7 children. Thomas died in 1903 and Amanda in 1918. Several of their children remained local. The last of them passed away in 1938. Note on source: Much of the info from this article was found in the book “Signposts II” by Patricia Loomis, printed in 1985 by the Rosicrucian Press in San Jose. The book details information on the historical background of street names and places in Santa Clara County – about 50 of them in all. This book can be purchased used from Barnes & Noble for about $15.